The most famous jam session in rock and roll history took place on December 4, 1956. 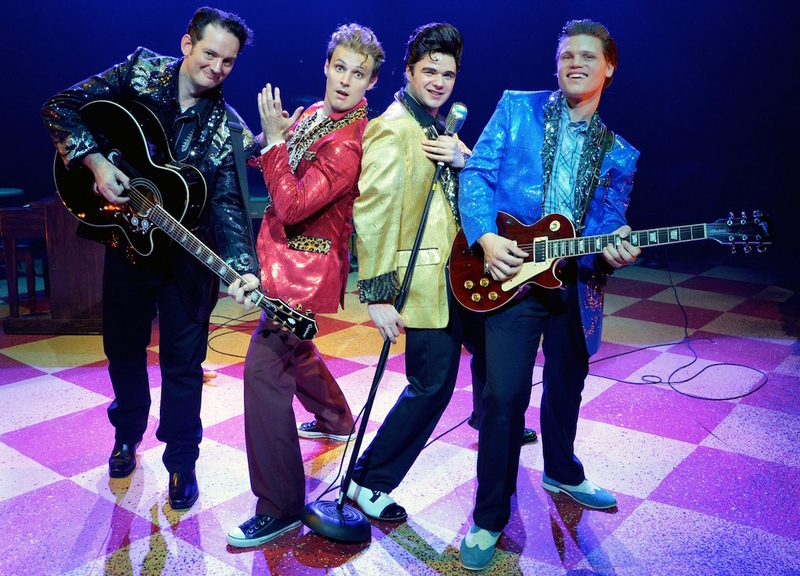 Million Dollar Quartet is the story of the first and only time Elvis Presley, Johnny Cash, Jerry Lee Lewis, and Carl Perkins would perform and record together. The place was Sun Records in Memphis, Tennessee., owned by Sam Phillips – credited with discovering all four of these tremendous talents. The impromptu recording session happened by complete chance, and history was made that evening. We are introduced to a conflicted Phillips (James Ludwig), who is struggling with keeping his little recording studio afloat. He is already feeling the pains of selling Elvis (Ari McKay Wilford) to RCA, who has offered to buy Sun Records and let him work with “the King” once again. He has been given until the end of the night to make his decision, while meanwhile running a recording session to find a new number one hit for Carl Perkins (John Michael Presney). Joining them is Phillips’ newest talent, the always energetic Jerry Lee Lewis (Dominique Scott), who knows he is the next big thing. They are joined throughout the evening by none other Elvis himself, along with girlfriend Dyanne (Ryah Nixon), and Johnny Cash (Sky Seals) – who has been avoiding Sun Records for several weeks leading up to his contract renewal. The result is one magical evening that no one could have possibly expected. Think of the show as part concert, and part play, featuring a superband and the “Greatest Hits” from each of the musicians’ catalogs. The main characters are four of the greatest rock and roll artists in history, and the audience gets to be a fly on the wall for one of the most exclusive recording sessions in history. “Blue Suede Shoes,” “Folsom Prison Blues,” “Fever,” “Brown Eyed Handsome Man,” “I Walk the Line,” and “Great Balls of Fire” are just a sampling of the hits you will hear. 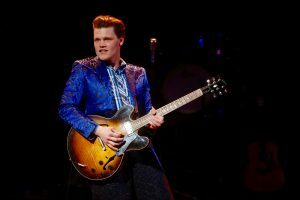 John Michael Presney as Carl Perkins. Photo Credit: Jerry Naunheim, Jr. The four leads all have great voices, and are extremely talented when it comes to playing their instruments. The two standouts of the show, however, would have to be John Michael Presney as Carl Perkins, and Dominique Scott as Lewis. Presney plays rhythm guitar for essentially the entire show, and is clearly an expert when it comes to his craft. And Scott has an energy which is undeniable, never letting the audience experience a dull moment, and consistently brings the laughs (when he isn’t impressing with his piano skills). Meanwhile, Sky Seals brings both the look and sound of Johnny Cash, as Wilford has all of the body language down pat. The set design for the show is masterful. What Scenic Designer Adam Koch has done to recreate the studio for Sun Records is truly awe-inspiring.It starts out as two sides of a building, gorgeous looking and meeting at center stage. It soon opens up to the inside of the studio, which never looks like just a set. Every detail from the recording booths, to the gold records on the walls, is handled with care. The set alone is a sight to behold. 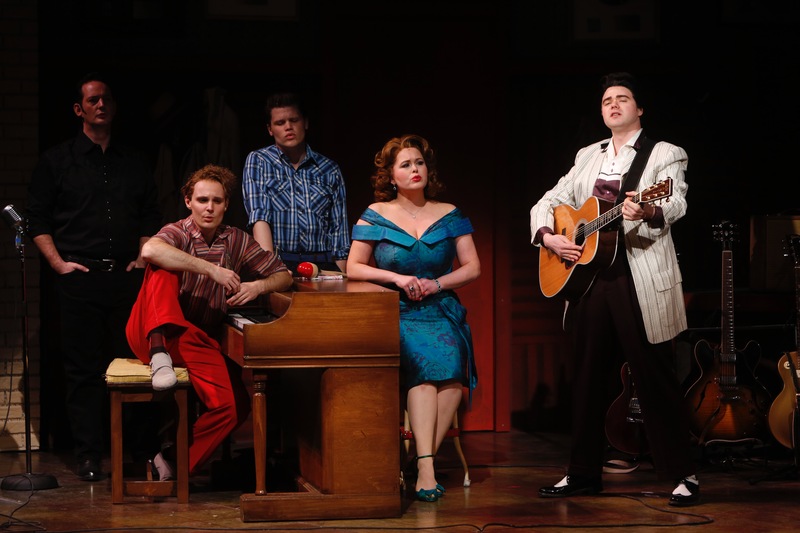 Million Dollar Quartet is a fun and fascinating story, full of fantastic performances and some of the best rock music in history. If you are a fan of music from the era, you will love seeing your favorite artists brought to life on-stage. 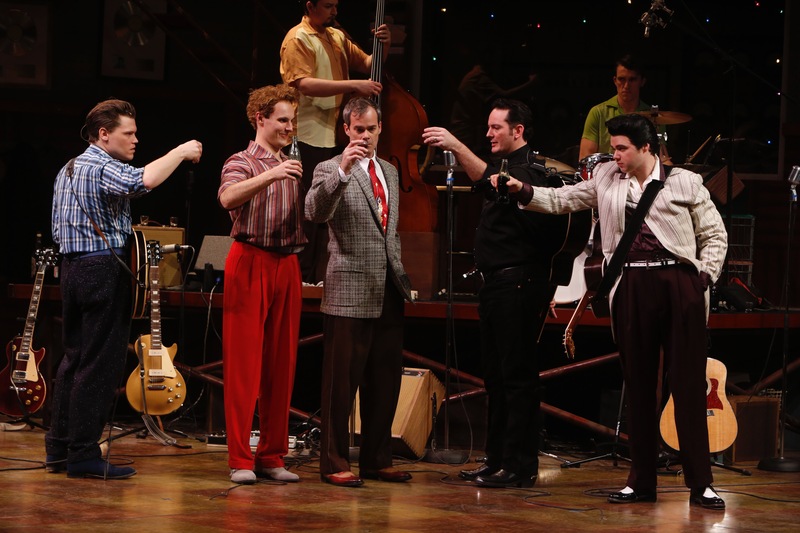 And it isn’t just a concert; the show is well-written and delves into some emotional scenes for all of the characters. Yet at the end of the day, it feels like one big party that you never want to leave. And there is no better way to celebrate 50 years of the Repertory Theatre of St. Louis. Tickets are available here for performances ending April 9. For more information, visit repstl.org. Photo Credit: Jerry Naunheim, Jr.